With a heart rate monitor, screen and in-depth app, is this the fitness tracker you've been waiting for? Fitness trackersare the big story in wearables to date. Some, like theMicrosoft Bandadd in GPS to track runs and bid to altogether more serious. The Charge HR from market leaders Fitbit, however, is more your classic fitness band - counting steps, tracking sleep and keeping you up to date with how far you've walked and how many calories you've burned. First up, the charge has an OLED screen, which straight away puts it ahead of devices such as the Jawbone UP3. Yes, it's tiny, but it's also very bright, and it means you're not reliant on the Android/iOS/desktop web app to check how many steps you've taken during the day. The main issue with it is that it turns itself off after just a few seconds, so if you want to keep checking your heartrate or distance when working out/running, well… tough luck, you'll have to keep pressing the little button every few seconds. This, to be fair, is presumably to conserve battery life, which clocks in at about four days. The Jawbone Up3 also has a heart rate monitor and lasts 5-6 days longer than that, but this is a better device, so I can live with the more frequent charging. What's more annoying is that the charging cable is ridicuously short, and different to that found on every other Fitbit, so if you're looking to use both this and a Surge, or are upgrading from an earlier Fitbit, well… Tough luck again. The feel and build of the Charge HR are exemplary however. It's slim, black and light. Discreet and comfortable enough to wear long-term (it's "shower resistant", though not waterproof, so as long as you don't swim, you could theoretically wear it 24/7 in between charges), it also has a proper strap, like a watch, rather than trying to be clever with lugs and clips, as so many fitness bands idiotically do. It does weather a bit with time, but in a cool, rugged way, at least in my opinion. And no, it didn't give me a rash, despite what comes up if you Google "fitbit rash". 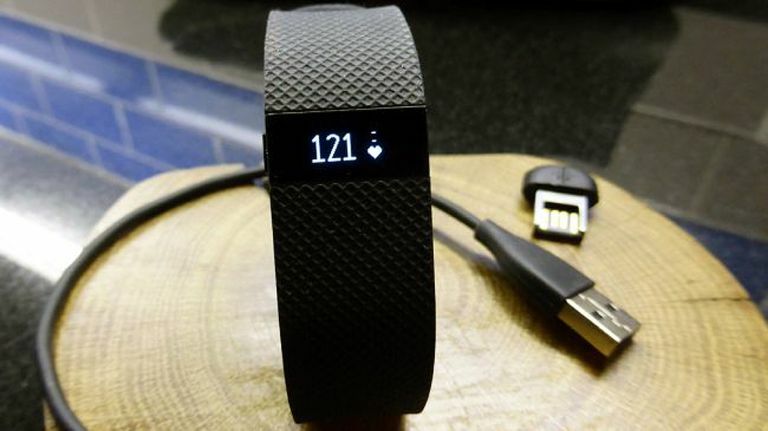 As a step counter, the Fitbit Charge HR is solid. It's not 100% accurate, but it's not a million miles off, and it's consistent. Its estimates of how far you've walked are pretty worthless but I don't really have a problem with that. Its calories burned estimates seem unusually accurate to me - a lot of fitness bands are clearly trying to flatter their wearers with ludicrously inflated calorie-burn numbers. That's presumably helped by the HR monitor helping to give a more accurate estimate. As a "stairs climbed counter"? Well, that's less good, but at least the Charge HR tries. As far as most trackers are concerned, climbing up 10 flights of stairs has the same fitness value as walking 100 or so steps, which is obviously nonsense. However, the Charge HR consistently over-estimates how many stairs you've been up. The Charge HR will also have a go at tracking more intense exercise. Just hold down the button till you feel a vibration and then get running/cycling/pumping iron. This is not helped by the absence of built-in GPS on the Charge HR but again, though not brilliantly executed, it is better than most other non-GPS trackers. When tracking cycling, for instance, it adds a number of steps and stairs climbed to your daily total, presumably based on your exertions as calculated by the HR monitor and your elevation as calculated by the altimeter. The numbers generated are clearly never going to be spot on, but they give at least some idea of how active you've been. Far more usefully, Fitbit is compatible with the likes of Strava, MapMyRun and Endomondo. This means you can use these apps on your phone and have their much more accurate distance and calorie info fed into your Fitbit account. This does mean you can't leave your phone at home when exercising but, you know, get over it. The pulse tracking is probably more useful in terms of showing how your average/resting heart rate is changing over time, though I do question the usefulness of this as a metric for most people. When exercising, the accuracy is okay - though it does cut out entirely at times, which is frustrating - but it's hard to see what HR zone you're in while working out because you can only have the screen on for a few seconds at a time. The app will let you know afterwards, but again, I question the usefulness of that. Despite having that pulse monitor, the sleep montoring part of the Fitbit Charge HR is not amazing. Compared to a Withings Aura (that's what you can see data from in the graph on the right) or the Jawbone Up3, it appears noticeably less accurate and in depth, doing little more than telling you how long you've slept for, without insights into periods of deep, light or REM sleep. On the plus side, you don't need to press a button to tell it you're planning to doze off. On the minus side, this seems to make it slightly less accurate in terms of detecting how long you've slept for. In short: you'd be better off taking the Charge HR off and charging it overnight. The interesting thing about Fitbit is that while the actual devices pre-Surge - including this one - are quite basic, the versatility of Fitbit's app, plus the way the devices link up with third-party apps, makes the overall Fitbit ecosystem impressively all-encompassing. The app is excellent. It shows all your activity from today, with a decent calories-burned estimate, and also for the week. It's harder to dig further back into your fitness history, but for this kind of tracker, arguably that's not so useful anyway.You can also gain greater insights by shelling out for Fitbit Premium, which compares your stats to Fitbit users everywhere. Without a Premum subscription, you can still compare to people in your network of Fitbit friends. You can enter food you've eaten using either Fitbit's own database or MyFitnessPal, so it's useful for dieters of the type that have the willpower to log everything they eat, but not the willpower to just eat less in the first place. You can also log water consumed then show off to your peers about how hydrated you are. Fitness trackers are funny things. Much of their core functionality - step counting, run tracking - can be handled as well or better by most smartphones, they're not cheap, andtheir overall ability to get you fit is questionable. Hoewever, all things considered, if you're in the market for a fitness band, and don't need the extra functionality of the Microsoft Band or Fitbit's own Surge, this is the one I'd recommend to most people. It's comfortable, light and compact, has a screen unlike several key competitors, and the heart rate monitor has some value, though it's a bit under-utilised and inaccurate. The main thing that the Charge HR has going for it is Fitbit's eco-system. You can also tap into this via cheaper devices such as the Charge (with no HR) and Flex, but the Charge HR gets the most out of it, and is the nicest device. In summary then: Fitbit Charge HR FTW!